Download noVNC , noVNC must be in the location specified by –vncproxy_wwwroot, which defaults to /var/lib/nova/noVNC. nova-vncproxy will fail to launch until this code is properly installed. I have a two nodes cloud running. Below is the nova.conf file. 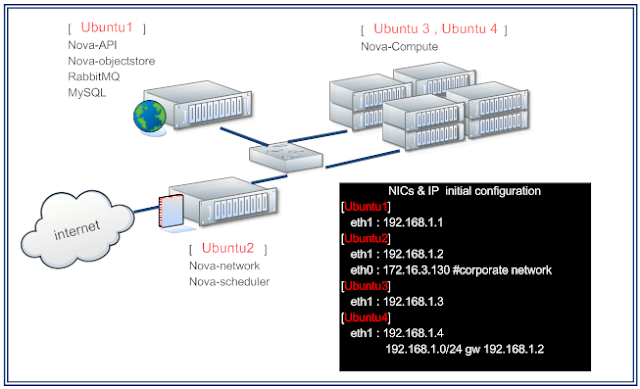 In this case, how should I configure the vnc in the nova.conf? Thanks for responding. I'm still confused with the ip addresses, 192.168.1.1, 172.16.4.75 and 192.168.2.4(ip of server 30) in your case. In my case, the public ip of the cloud controller is 192.168.0.2 and the private ip is 10.1.1.1, the ip of instance is 10.1.1.2. How should I configure the vnc? OK, I know the reason why that you feel confusing. Bcz the environment is a little bit different from regular one.